Do you dislike needles, but want the benefits of Acupuncture? Do you repeatedly injure your lower back? Do you have sciatica/ leg pain? Do you often feel tension in your neck? Do you often feel pins & needles/ numbness in your arm(s) or leg(s)? If you answered ‘yes’ to any of these questions, then Physiotherapy and Acuhealth may work well for you! The Acuhealth Pro 900 is a hand-held, 9V battery-powered electronic acupuncture point finder and stimulator. 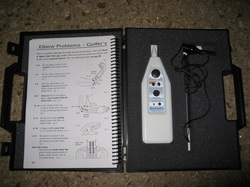 It is used to accurately locate and stimulate acupuncture and trigger points using a low-frequency current. A trial of at least two treatments is recommended, combined with home exercises. If it is effective, Acuhealth treatments would continue until your symptoms resolve, or if it is needed beyond discharge from physio, an Acuhealth unit can be purchased for home use. It can usually be taught to a patient’s caregiver in one visit and it comes with a manual which is easy to read and follow. Contraindications include pregnancy and cardiac pacemaker. Acuhealth home use is a fantastic medication-free method to self-manage one’s symptoms, combined with or upon discharge from physiotherapy. No extra charge during your physiotherapy visits when recommended by your physiotherapist.